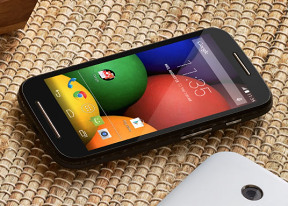 Motorola Moto E review: Have a break! The Motorola Moto E comes with Google Chrome as the default web browser out of box instead of the generic Android browser. While the minimalist interface hasn't changed since Chrome launched on Android, the browser is being constantly refined by Google, and this has resulted in one of the smoothest and most powerful browsing experiences we've encountered on a mobile. Moto E also features the Quick Office, which supports creating, viewing and editing office files (docs, xls, ppt), and it can also read PDFs. Motorola has implemented its own version of a Do Not Disturb feature via their Assist app. It will keep the Moto E quiet while you're in a meeting or sleeping. The Alert app allows you to select your emergency contacts, input ready-to-go messages and in case something happens you can call your contacts, send them messages with GPS coordinates, or ask them to follow you. The latter will make your Moto E send your GPS coordinates at specified interval. Another great support tool, which is available to all Android devices, is the Android Device Manager. It's keeps you connected to all Android devices, on which you've setup your Google account. It can help you find your misplaced device by ringing it and if it's not at the house, by finding it on the map. If it gets stolen, you also have the option to lock the device and delete all data. What few people seem to realize is that for the remote locking to work, you have to initially enable it on your smartphone via the pre-installed Google Settings app.